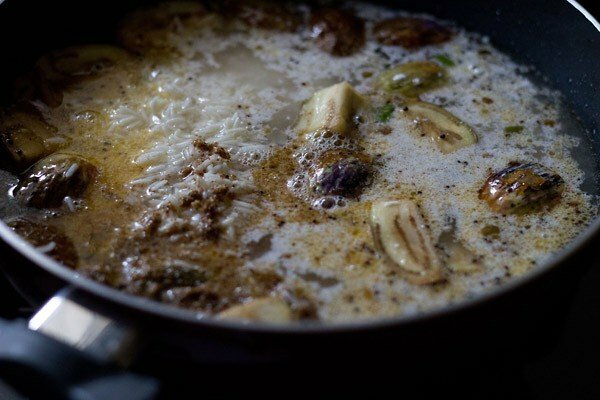 vangi bhaat recipe with step by step pics – spiced and tasty baingan rice made with freshly ground spices. 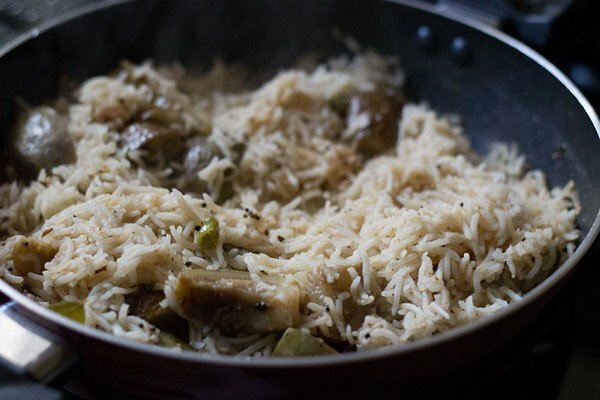 vangi bhaat is prepared in the same way as a masale bhaat or tondli bhaat (ivy gourd rice). 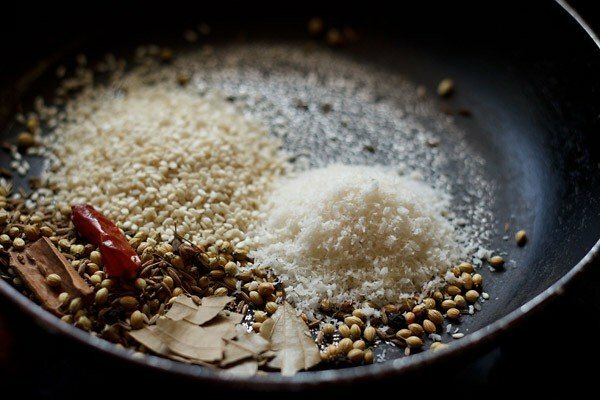 goda masala is added in these rice recipes and this spice blend gives the vangi bhath its unique flavor, taste and aroma. 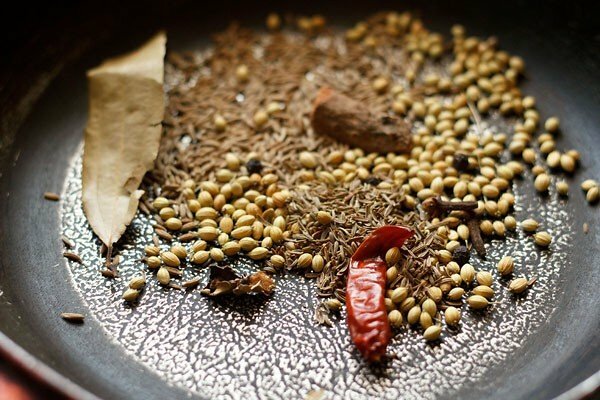 in this recipe, i have roasted and ground the spices to prepare the goda masala, so there is no need of having a ready goda masala. if you do have goda masala powder, then skip grounding the spices. 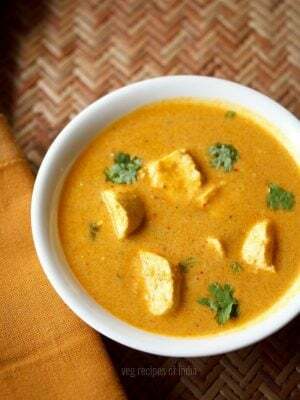 vangi bhaat is a relatively easy recipe to prepare. 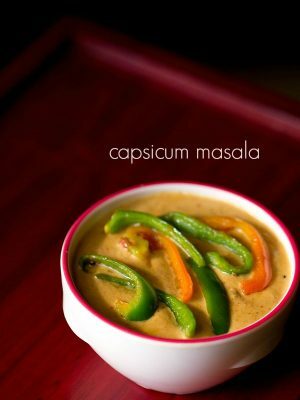 one pot meal which is healthy as well does not take much time, if you have ready goda masala. i have cooked the rice in a kadai, but you can also cook in pressure cooker. this maharashtrian vangi bhath is different from the karnataka version. the karnataka version of vangi bath has vangi bath masala which is a different spice blend than the goda masala. 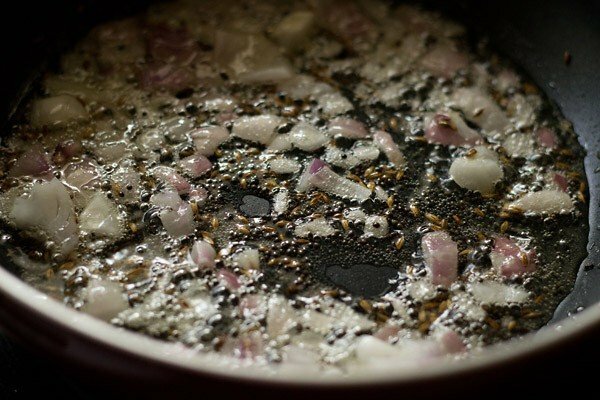 i have added onions in this maharashtrian vangi bath recipe. you can easily skip them if you don’t have onions and add a pinch of asafoetida (hing) in the tempering instead. 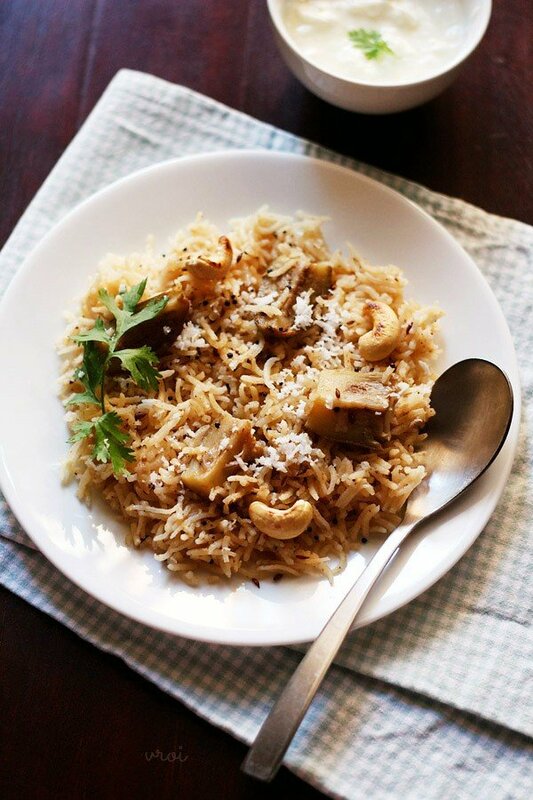 serve this maharashtrian recipe of vangi bhaat plain or with side bowl of yogurt or raita. 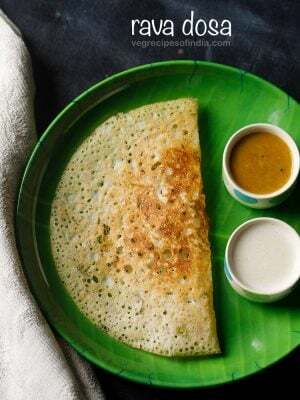 on a low flame in a small frying pan, dry roast the whole spices mentioned under the list "for the goda masala", except sesame seeds and desiccate coconut. roast the spices till they become aromatic. then add the desiccated coconut and sesame seeds and continue to dry roast till the coconut becomes golden. keep stirring regularly so that the coconut does not get burnt. let this spices cool. once the roasted spices + coconut mixture gets cooled, grind them fine in a dry grinder or coffee grinder. keep this small batch of goda masala aside and just add about 2 to 3 tsp of it in the vangi bhaat recipe. the remaining goda masala can be kept in the fridge in a small bowl or box and added to veggie dishes or dal. rinse the rice for a few times in water. then soak the rice in water for 30 minutes and then drain them. keep the soaked rice aside. keep the chopped vangi in a bowl of salted water for 15 minutes. 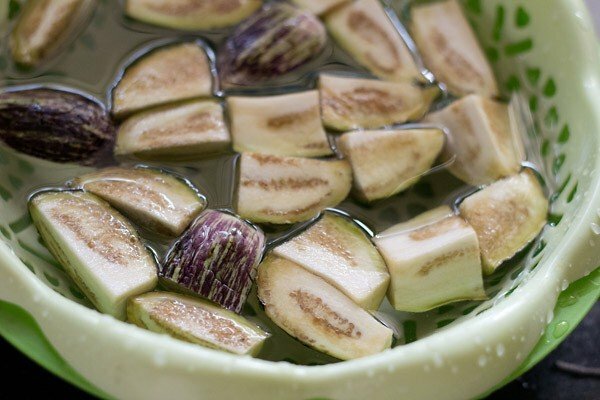 this soaking does not discolor them and gets rid of the bitterness if any. 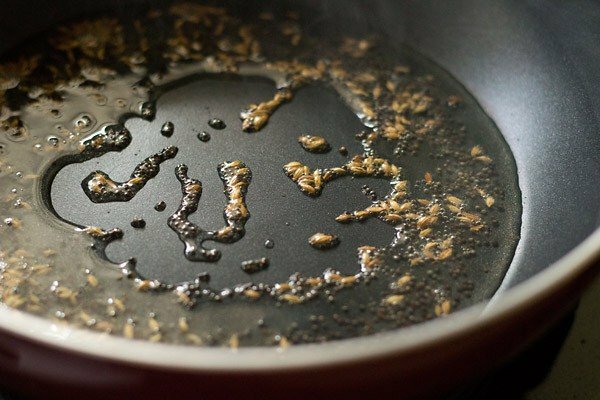 heat oil in a large thick bottomed pan and splutter the mustard seeds and cumin seeds. then add onions and saute till the onions turn translucent. add curry leaves and green chilies. stir. then add the drained brinjals (vangi) along with turmeric powder. stir and saute 3 to 4 minutes. then add the soaked rice, 2 to 3 tsp of the freshly ground goda masala and yogurt. stir and pour water. season with salt. again stir very well. cover with a lid and cook the rice on a low flame till the grains are tender and cooked. 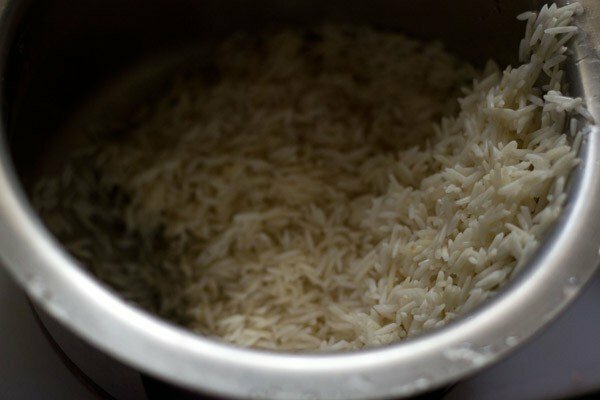 in case the rice has not cooked and the water has dried, add some water and stir gently and continue to cook the rice. meanwhile, roast cashews in a pan till they get some brown spots on them. instead of cashews, you can also add peanuts and roast them in the same way. once the rice is cooked, fluff the vangi bhaat gently. add grated coconut, chopped coriander leaves and the roasted cashews. mix gently. 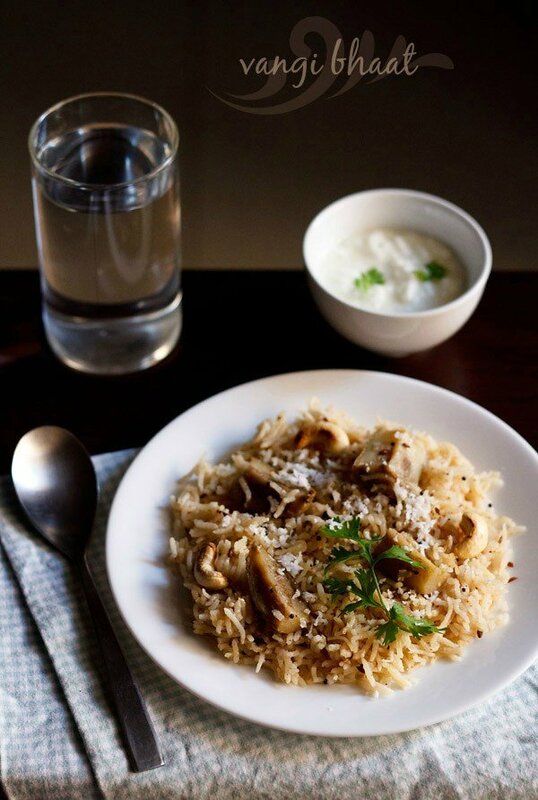 serve vangi bhaat plain or with a raita hot or warm. you can also garnish vangi bhat with coriander leaves and grated coconut while serving. 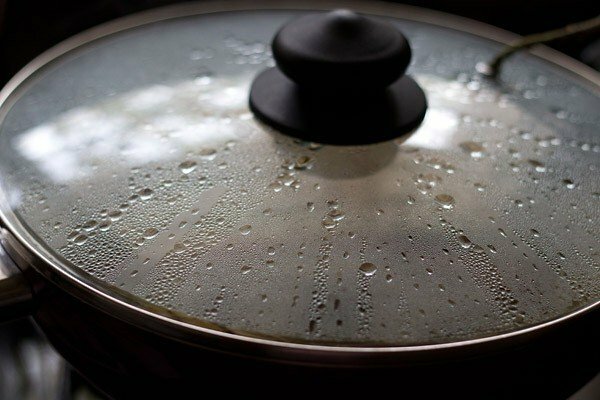 for cooking in a pressure cooker - add about 2.5 to 2.75 cups water and pressure cook for 2 to 3 whistles. 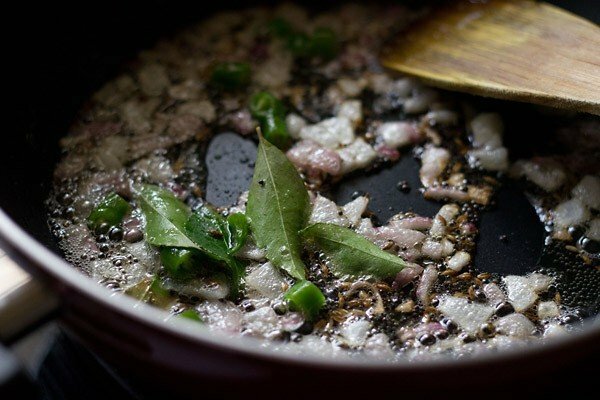 1. on a low flame in a small frying pan, dry roast the whole spices till they are aromatic. 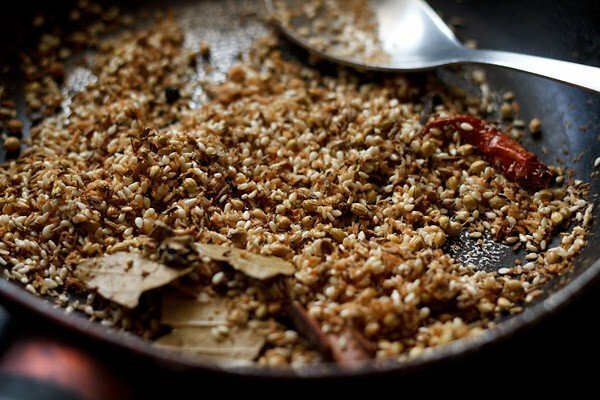 2. bring the roasted spices to the side of the pan and add the desiccated coconut and sesame seeds. 3. stir & continue to dry roast till the coconut becomes golden. keep stirring regularly so that the coconut does not get burnt. let this spice and coconut mixture cool. 3. soak the rice in water for 30 minutes and then drain them. keep aside. 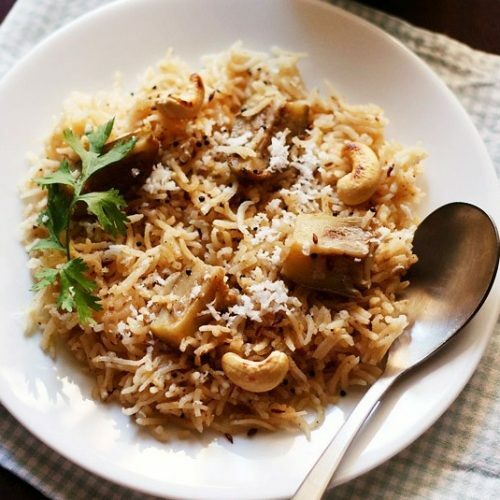 you can add basmati rice or ambe mohur rice (mango blossom rice) and even sona masuri. 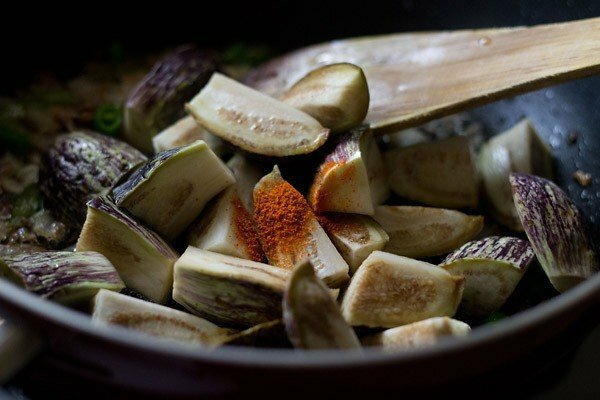 4. quarter or chop the vangi (brinjals or aubergines or baingan). keep the chopped vangi in a bowl of salted water for 15 minutes. this does not discolor them and gets rid of the bitterness if any. 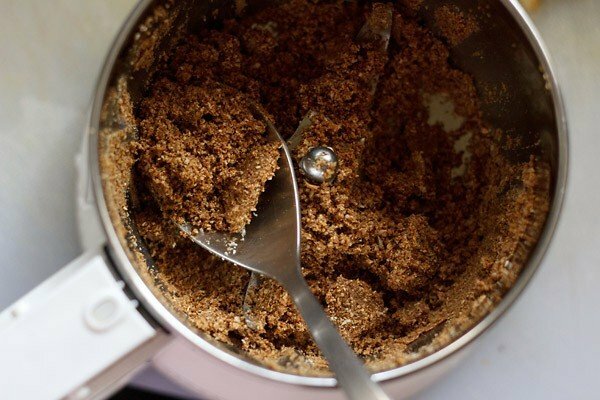 5. once the roasted spices + coconut mixture gets cooled, grind them fine in a dry grinder or coffee grinder. only 2 to 3 tsp of the goda masala (as per your taste) needs to be added to the rice. the remaining goda masala can be refrigerated and added to vegetable dishes or lentils. 6. heat oil in a large thick bottomed pan. first splutter the mustard seeds and cumin seeds. 7. then add onions and saute till the onions turn translucent. 8. add curry leaves and green chilies. stir. 9. then add the drained brinjals (vangi) along with turmeric powder. stir and saute for 3 to 4 minutes. 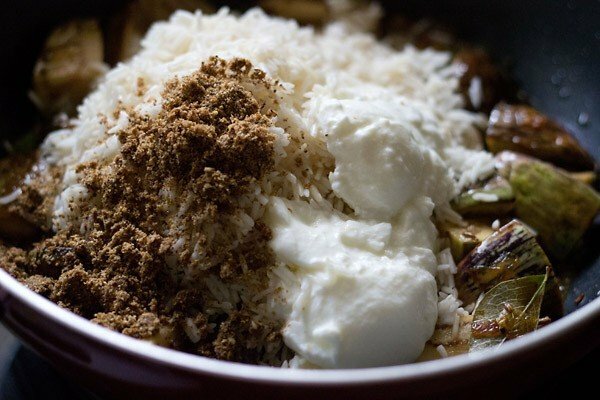 10. stir and then add the soaked rice, 2 to 3 tsp of the freshly ground goda masala and yogurt. 11. stir and pour water. season with salt. 13. cover with a lid and cook the rice on a low flame till the grains are tender and cooked. 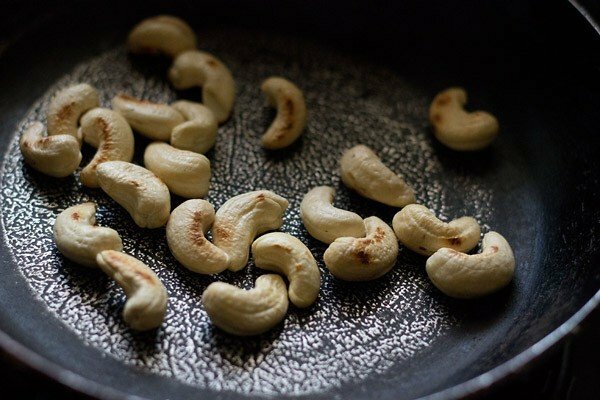 14. meanwhile, roast cashews in a pan till they get some brown spots on them. you can also add peanuts instead of cashews. just roast them in the same way. 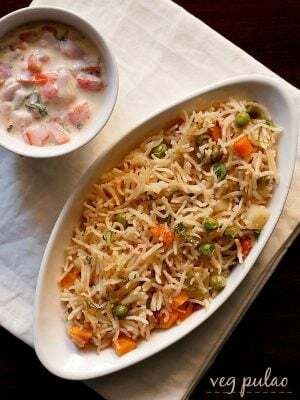 15. once the rice is cooked, fluff vangi bhaat gently. 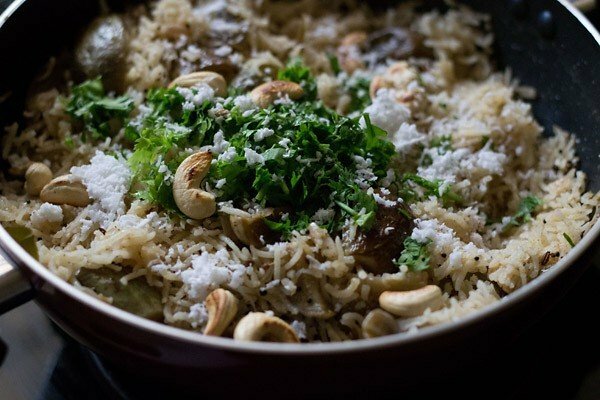 16. add grated coconut, chopped coriander leaves and the roasted cashews. mix the vangi bhaat gently. 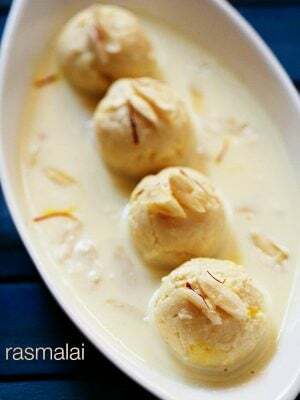 17. serve vangi bhath plain or with curd or with a raita hot or warm. you can also top with a bit of ghee while serving vangi bhaat. 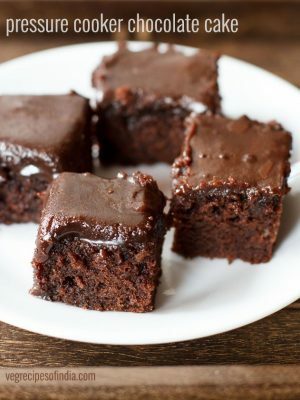 I have got so much praise from my family because of your recipes! how long is cooking vangi bhaat in a pressure cooker if you do not have a whistling pressure cooker please? 8 to 10 minutes with rice which has been soaked for 30 minutes. this recipe is not the karnataka version. this is the maharashtrian version of vangi bath. 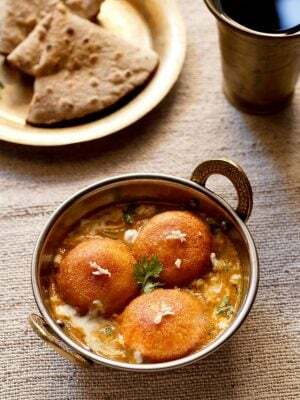 vangi bath is also a popular dish from the maharashtrian cuisine. I thought of making a different kind of vangi bhath last night (usually I make Karnataka style) and this turned out so good, I’m glad I have more masala rice options now. Instead of usual raita, I made cucumber pachadi (Andhra style). I must say, the addition of fresh coconut to cucumber, goes really well with spices in this dish. I suggest you give it a try! thanks shri. i know about the addition of fresh coconut to cucumber taste very good. in maharashtra there is a recipe which is more like a salad, where cucumber is tempered and then fresh coconut is added. its called as khamang kakdi. you can try this one too. 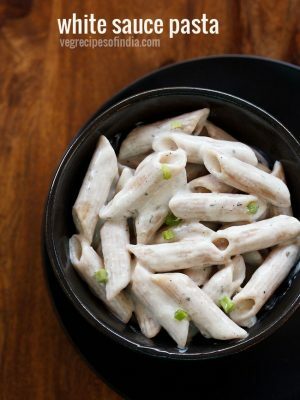 i will try the cucumber pachadi with this rice recipe. thanks. Can I add cooked rice in masala nd all? 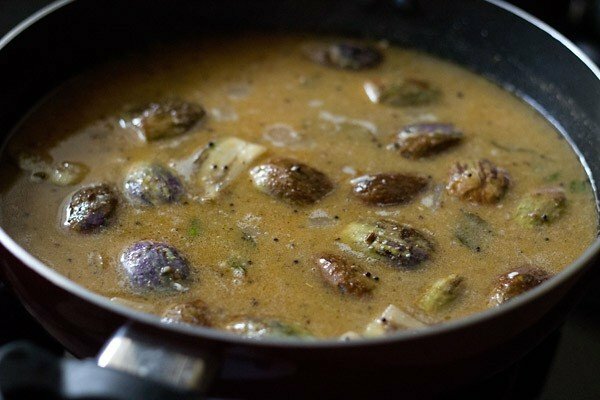 for that you will have to cook the brinjals in the gravy first. and then at last add cooked rice and mix well. just add 1 cup of water while cooking the brinjals. add everything except yogurt. instead of yogurt, add 1 tomato. I really like this recipe but my family don’t like brinjal so without bringal how is it? add mix vegetables instead like cauliflower, peas, potato, carrots etc. you can also make with just peas and potatoes. Thanks pavi. Black sesame seeds also work well. Stone flower is added and it gives a musky aroma. But without it also vangi bath can be made. Roasted almonds is a nice addition. I tried boondi ladoo for diwali was superb thanks a lot. Hello! These recipes look wonderful! I love Indian food and am trying to figure out ingredients to buy at the grocery store to make these recipes. It’s tough not knowing what each item is. I will have to do my research. Thanks for the recipes! though a male, i like cooking and trying out new receipes, especially Indian. I like Maha food. I hv to try the vangi bath. venugopal, thats nice to know. happy cooking. Tried your recipe yesterday. Turned out very good. Your step by step photos are great. Really appreciate your work. In the goda masala recipe, which one of the following do you use as dagad phool/stone flower/patthar phool? I have got the first one. Is it ok to use that in the goda masala recipe? hi anu, its not the first one. the first link is a pic of chakra/chakri phool (star anise in english). the second link is correct. it is dagad phool. 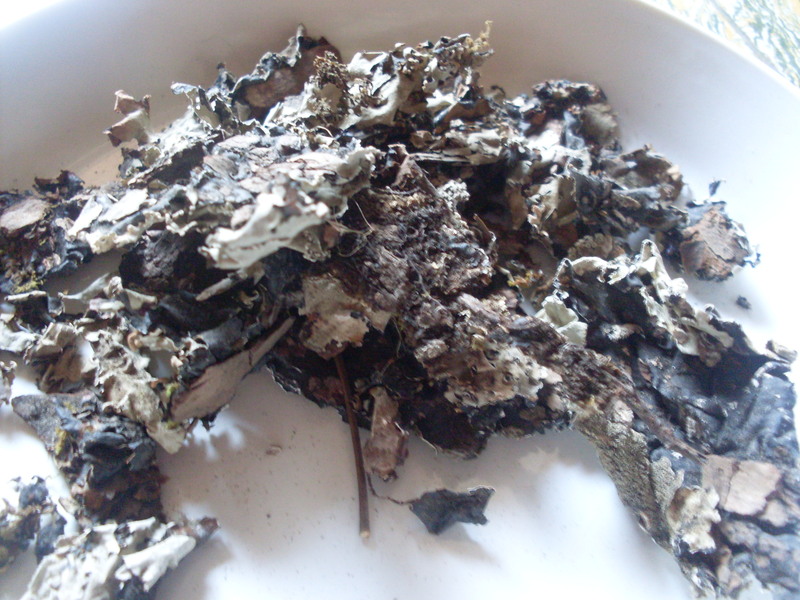 they are black and white papery thin dry lichens. chakri phool can be added. if you cannot get, then just skip it. if adding star anise, then just half of it is fine.